"This recipe makes me feel good. It's very different. There a number of steps, so you can't just put it on the stove and leave it, but the results make it worthwhile. Can be made with ground turkey or vegetarian, and it's dairy-free." Heat olive oil in a large soup pot over medium-high heat. Cook and stir turkey, onion, and garlic in the hot oil until turkey is crumbly, evenly browned, and no longer pink. Season turkey mixture with ginger and red pepper flakes. Stir sweet potatoes into pot and cover with 6 cups water. Simmer until sweet potatoes are tender, about 10 minutes. Meanwhile, bring 2 1/4 cups water to a boil in a saucepan. Remove from the heat and stir in couscous. Cover and let stand for 10 minutes, then fluff with a fork; set aside. Mix peanut butter with about 1 cup liquid from the sweet potato stew in a bowl until smooth. Pour peanut butter mixture back into the pot. Mix Swiss chard into stew and cook until tender, stirring often, about 5 minutes. Season with salt and black pepper. 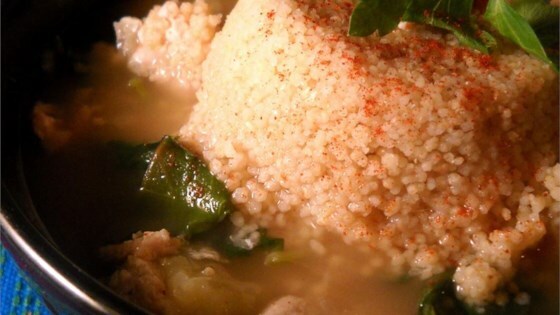 Serve stew spooned over couscous. See how to make roasted sweet potato chili. Different, but quite tasty. Did use some salt tho. Didn't do the turkey, but it was GOOD anyway!